The police officer fatally shot outside Prince George's County Police headquarters in Maryland on Sunday was accidentally hit by another officer in shootout that erupted when a man opened fire unprovoked, police said Monday. The gunfire between police and the man was videotaped by his brothers, police said. Officer 1st Class Jacai Colson, 28, died after Michael DeAndre Ford, 22, opened fire about 4:30 p.m. Sunday, Police Chief Hank Stawinski said at a news conference Monday evening. Ford's brothers, Elijah Ford, 18, and Malik Ford, 21, were with Michael Ford, of Fort Washington, at the time of the shooting, police said. At least one of the brothers recorded the attack. "That individual videotaped it as if it's a game, as if it's something we're going to put on YouTube and glorify," John Teletchea of the Maryland Fraternal Order of Police said. "This was callously recorded and could have been prevented," Stawinski said. An image provided by police shows a man's hand in the rear-view mirror of a red car, apparently recording. Police believe Michael Ford, who Stawinski said had a history of mental illness, intended to die at the hand of an officer. Two minutes before his brother drove him to the District III station, he recorded his will on a cellphone, police said. Colson, who would have turned 29 this week, was killed as he tried to take down the gunman, Stawinski said. The Ford brothers. From left to right: Michael, Elijah and Malik Ford. 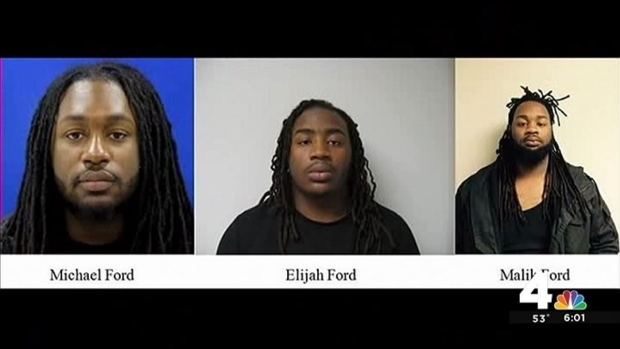 Prince George's County Police say the three are in custody in connection with the fatal shooting of a Prince George's County police officer. "Seeing a shooter, he took action and demonstrated extreme heroism," he said. "Detective Colson drew fire to himself and in doing so was mortally wounded." Colson was inadvertently hit by another officer, Stawinski said the officer's autopsy showed. He had been wearing plainclothes and no body armor. 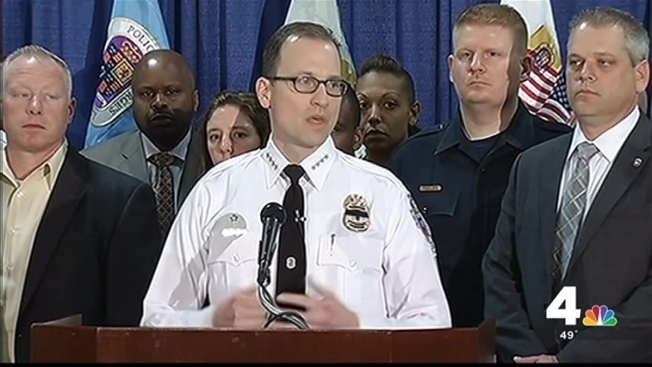 "Circumstantially, we believe that the shot that killed Detective Colson was fired by a fellow Prince George's County Police officer, reacting to this," the police chief said. He refused to name the officer. "I am not prepared to say which of those officers fired that round," Stawinski said. Colson encountered Michael Ford as he exited an unmarked car and started shooting at cars and an ambulance near police headquarters, on Barlowe Road in Palmer Park, Maryland, Stawinski said. The narcotics officer returned fire, trying to stop the shooter. Three other officers also fired, the police chief said. "It wasn't about anything," Stawinski said. "This man launched an attack on a police station and engaged several Prince George's County police officers in a gun fight, to which they responded -- heroically." Colson was shot and rushed in the back of a police cruiser to Prince George's Hospital Center, where he was later pronounced dead. Michael Ford received non-life-threatening injuries and also was taken to a hospital. Dennis Sharp, who lives in the area, said he heard the shots and witnessed the chaos. "I heard four or five shots ... I got up when I heard the helicopter, and I came outside, and that's when I saw the policemen, and everyone was in a frantic state," he said. Elijah and Malik Ford fled the scene, police said. Malik Ford, who was driving, was found about a mile away, hiding in the bathroom of a Popeyes fast-food restaurant, police said. Sources told News4 his text messages with Michael Ford led police to him. Elijah Ford was found at home in Landover. All three Ford brothers will be charged with second-degree murder, attempted first-degree murder, use of a handgun in the commission of a felony and other charges, police said. Additional charges may be added. Michael Ford is expected to recover. Information on whether they'd retained attorneys was not available immediately. Police officers surrounded Colson's parents Monday evening as top brass announced updates in the case. The officers usually would have lined the back of the room. Colson's mother and father stood bravely, though clearly anguished by the man who was by all accounts an extraordinary person. Teletchea, of the police union, called Sunday "a dark day in Prince George's County." The county state's attorney, Angela Alsobrooks, called the shooting an act of "evil" and "cowardice." Prince George's County Police said a gunman opened fire at passing cars (pictured right) while his brothers stood by. They released the photo at right of one of the brothers in a car nearby. Maryland Gov. Larry Hogan ordered flags to fly at half-staff in honor of Colson. Colson, a four-year veteran of the police department, grew up in Boothwyn, Pennsylvania, and is survived by his parents and younger brother, police said. He graduated from Chichester High School in 2005. Pennsylvania Gov. Tom Wolf ordered all U.S. and state flags at the state capitol and state facilities in Delaware County to fly at half-staff in honor of Colson. Colson is the second local police officer to die in the line of duty recently. Two weeks ago in Prince William County, Virginia, 28-year-old Officer Ashley Guindon was shot and killed on her first day on the job. Two other officers were also shot and are recovering. They were responding to a domestic dispute at a home in Woodbridge. Anyone who witnessed the shooting is asked to call police. The police chief asked anyone driving near the police station about 4:30 p.m. Sunday to check their car for bullet holes. An inspection of that evidence could help police.